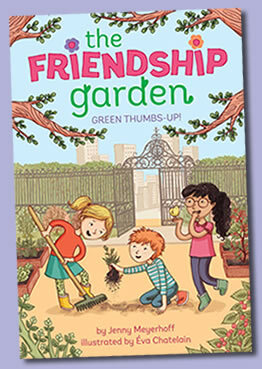 To make a new city feel like home, Anna gets involved with a community garden—and cultivates new friendships as well as flowers and vegetables—in the first book in the Friendship Garden series. It may be the orange and red season of fall, but eight-year-old Anna Fincher feels nothing but gray. She and her family have just moved to Chicago for her mom’s new job. Not only does Anna miss her tiny hometown and her true-blue best friends, but she misses her garden. Over the summer she and her friends had been growing big red tomatoes, bright green beans, and pink raspberries on a small plot of land in Anna’s backyard. Now, just when it’s fall harvest time back home, Anna is stuck in a boring apartment with no yard, and starting a brand-new school with kids who are anything but friendly. Until one day Anna makes an amazing discovery: a little community garden right in the middle of the city. And a small idea begins to take root in a big way. What if a bunch of kids took over a neglected, forgotten little garden plot? Could they make anything bloom—even friendship? 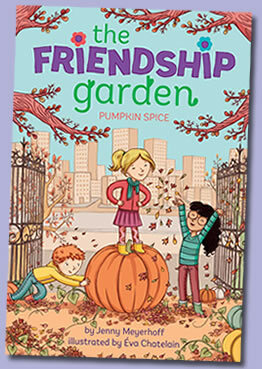 Anna and her community gardening friends are excited for the Windy City Pumpkin Fest but then their prize pumpkin disappears in the second book in the Friendship Garden series. Besides tons of yummy fall food, Anna is excited for the Windy City Pumpkin Fest. There is going to be a bake-off, a moon bounce—even a biggest pumpkin contest! Anna, Kaya, and Reed are sure that their pumpkin, Herbert, will take home first prize. But just two days before the contest, Herbert disappears! Kaya and Anna are sure someone stole their perfect pumpkin. After all, pumpkins can’t just get up and walk away by themselves. Can the Friendship Garden crew catch the orange-fingered thief in time for the festival? 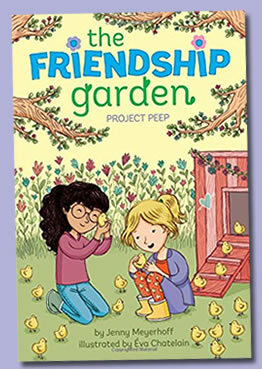 Anna and her community gardening friends spring into action to help raise baby chicks in the third book in the Friendship Garden series. When Anna moved to Chicago, Kaya became her first real friend, so for her birthday Anna is determined to give Kaya the best present ever! The problem is, the thing Kaya wants more than anything is a pet, but her parents have a strict no-pets rule. Then Anna remembers that Mr. Hoffman’s third-grade class just hatched baby chicks! Anna decides that rather than sending the chicks back to the farm, she’ll convince her teacher to let the Friendship Garden raise them, so Kaya can have a pet of her own. But raising chicks is no easy task. It requires supplies (that cost money) and building things like a coop and a run. How is Anna supposed to get everything ready and keep it a surprise…especially when Anna and Kaya usually hang out every day? Kaya begins to suspect “fowl play” and assumes Anna is ditching her as a friend! Anna feels terrible and what was supposed to be the best birthday present ever quickly turns into the worst one. Will Anna be able to come up with a way to win her best friend back before the chicks get sent back to the farm for good? 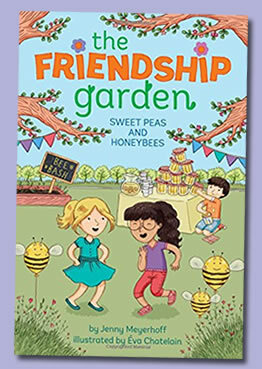 Anna and her friends throw a Summer Bee Bash in the fourth book in the Friendship Garden series. The Friendship Garden summer program is in full swing. The summer session, called Sweet Peas and Honeybees, is going to be all about flowers…and bugs. Anna hates bugs! But her little brother, Colin, loves them. And now he’s going to be following Anna around all summer long. B-L-E-C-H. The gardeners also meet Mr. Munoz, a beekeeper who lives nearby. He tells them all about how important bees are to gardens. When Anna finds out that the honeybees are in danger because of colony collapse disorder, she becomes obsessed with saving them. Maybe too obsessed! Kaya, Reed, and Bailey miss seeing Anna, who spends all of her time thinking of ways to rescue honeybees, and not enough time with her friends. At the same time, Anna’s little brother, Colin, won’t stay out of her way, and Anna just wants him to buzz off. Can Anna save the bees…or will her buzzing new hobby keep her friends far away? 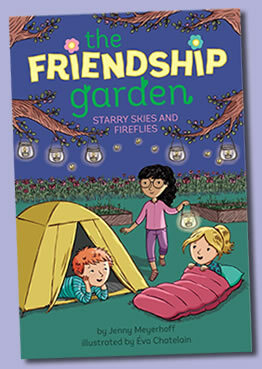 The fifth book in the Friendship Garden series finds Anna and her friends sleeping under the stars in the garden’s first-ever urban campout! Calling all campers! The Friendship Garden is having a summer sleepover under the stars! Get ready for: 1. Ooey, gooey s’mores 2. Toasty camp fires 3. Ghosts?? Anna is excited for an end-of-summer party with her friends, but she is NOT excited for creepy stories. Anna doesn’t like the dark…or being scared! But her buddies at the Friendship Garden want to tell ghost stories and play scary games! And Anna doesn’t want to look like a ‘fraidy cat, so she decides that she’ll just skip the party instead. Can Anna’s friends convince her that being scared is sometimes fun? Or will she miss out on the Friendship Garden’s party of the year? For Louie Burger, things are going great in the fifth grade. He has two awesome best friends, Nick and Thermos, he’s pretty much conquered his stage fright, and even mean ol’ Ryan Rakefield isn’t giving him as much flak. Yep, things are going pretty well. That is―until his dad has to go away for two weeks for a job and he is stuck with a house full of girls. 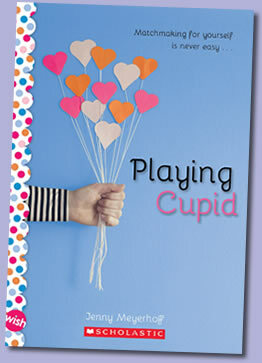 Suddenly, it’s makeup, princess dogs, love notes from your kissy-faced grandma, and heart-shaped pancakes all the time. 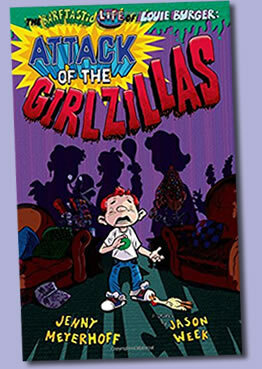 How can Louie be the man of the house when it is constantly under attack by girlzillas? 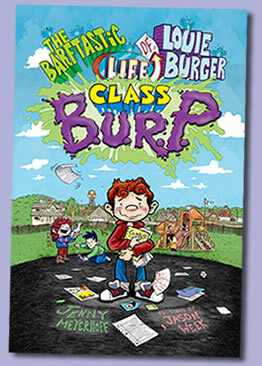 When a video of ten-year-old Louie Burger is aired on famous comedian Lou Lafferman’s TV show, Louie is sure that his days of being a class B.U.R.P. (Boy Used to Ridicule and Put-downs) are gone and that his popularity will skyrocket. But his fifteen minutes of fame are over before he even realizes it, and he’s suddenly back to being regular Louie. He tries to come up with ways to bump up his popularity, such as having the best Halloween costume. But Louie soon learns that in the end, friendship is more important than popularity anyway. 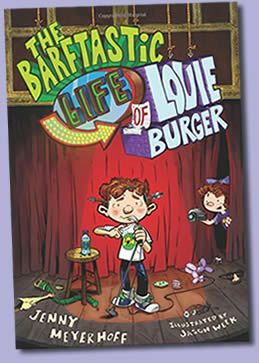 Fifth grader Louie Burger figures that with a goofy name like his, he must be destined to be a king of comedy like his idol Lou Lafferman. But he’s only ever performed his stand-up act in his closet, where he and his dad created the most exclusive comedy club ever—if by “exclusive” you mean that no one’s ever allowed inside. With the school talent show coming up, Louie’s wondering if now is his moment to kill (that’s comedian talk for “make actual people laugh”). And maybe, if he brings down the house, he’ll win back his former best friend Nick—who seems to be turning into one of those annoying sporty types—and fend off his dad’s home-improvement obsession, which threatens to remodel Louie’s comedy closet into a private bedroom for his older sister. Barftrocious! Is Sami ready for summer camp . . . and is camp ready for her? Samantha “Sami” Bloom is going to sleepaway camp for the first time. 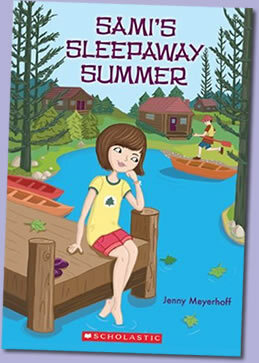 Sami’s big sister, Maya, has always loved her summers at Camp Cedar Lake, but Sami isn’t so sure she’ll feel the same way. She’s nervous about being away from home, trying new food, and doing the super-scary ropes course. Worst of all, Sami’s annoying cousin, Daniel, is attending the same camp. It’s sure to be a disaster! But Sami never counted on delicious Shabbat dinners, funny new friends, and more than a handful of surprises — one including Daniel himself. No matter what, this will be a summer to remember! Now that Polly Peterson has a baby brother she’s supposed to feel bigger, but her parents keep treating her like a toddler! And Zachary, the new kid, won’t stop teasing her, just because she’s the only third grader who hasn’t lost a single baby tooth. But when her tooth finally falls out, Polly has a new problem. She’s not sure she can put her tooth under her pillow. Maybe third graders are too old to believe in the tooth fairy. 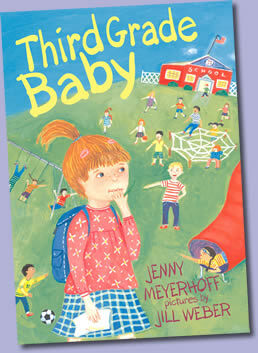 If Polly still believes, does that make her a third grade baby?